Ok, it won't be quite so long until another edition of Random Threads (my previous post). You really like those! I enjoy the comments so much. 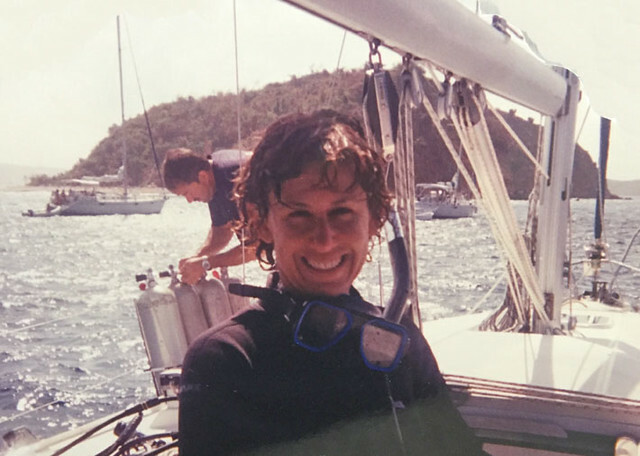 Of course everyone likes to have their opinions validated - the topic of scuba fabric brought a lot of you to exclaim how much you dislike wearing it. I think in carefully chosen garments it could be an OK choice - but I will stay away. Not that I was planning to sew anything using it. There are so many other better fabrics waiting for me. I just looked at the new Vogue summer pattern releases and didn't see anything that caught my eye. Which is just as well - plenty of patterns on my to-do list already. In fact a lot of them were unappealing to me - however the previous couple of releases had some items I want to make or have made. Including this pattern repeat, Vogue 9205. 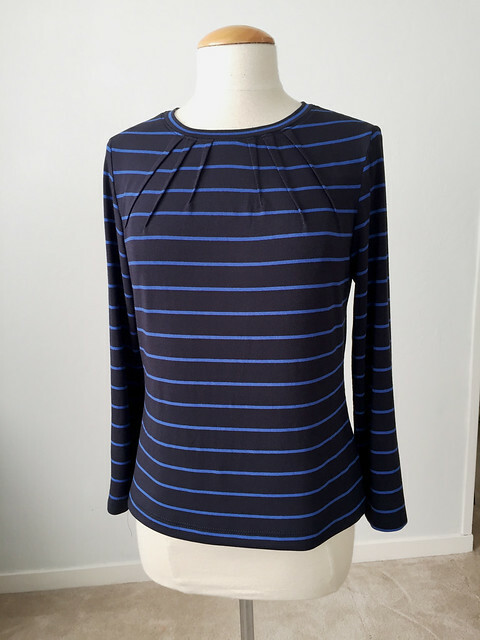 Which is a simple knit top pattern, and it even breaks my rule (not really a rule, more of a note-to-self) in which I only buy patterns that have multiple views or multiple garments in one pattern envelope. The idea of short or long sleeves, or doing a sleeve in a contrast color hardly counts as another view. But I love this pattern and am really glad I tried it out. I would say it while not ideal for stripes it worked pretty well. I bought this fabric at Stone Mountain - they really have some bargains in their upstairs space. Since they stopped doing classes they have a lot more square footage for fabric. This was something like $ 3 per yard, a really nice weight of rayon knit. I have some remaining which is always good to have for pattern testing, I use my knit scraps when I am playing around with a knit pattern to see style and fit. When I cut it out I thought I had the sleeve stripes matched up but they are off just a little bit. Oh well - for a first try on this pattern it's not too bad. And do non-sewers notice stuff like that? Here's the pattern piece for the front. I cut a size 12 and the fit was just right. I think the McCalls/Vogue patterns are perhaps reducing the amount of ease included these days - or designing for a closer fit? Does anyone else think so? At least the patterns for knits that I have used from Vogue and McCalls have fit fairly well with minimal alterations. I do always look at the finished garment measurements and see how that shapes up as compared to my measurements. On another note - I am really pleased with the neckband and how I very carefully cut it out so the light blue stripe would be centered on it. I can't even remember if I used the pattern piece (usually I don't) but I think I did since the rest of it was going together so well. 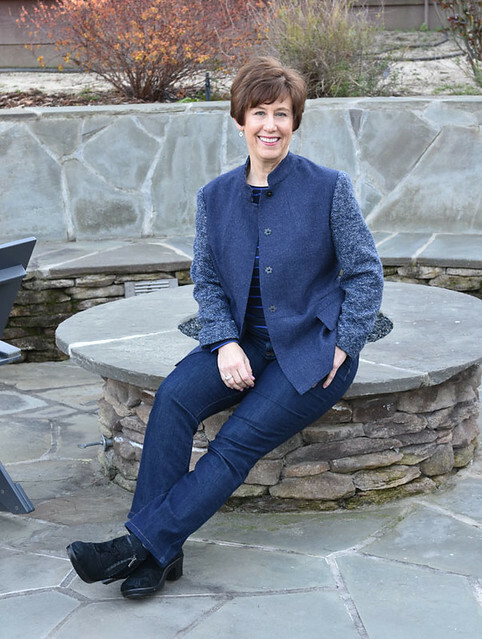 My pal Alice took these photos on the same day as we did the photos for my recent blue jacket. You can see that I'm wearing this knit top under the jacket. I think it goes well and makes a good combo. Not a lot of sewing detail and I'm sure I'll repeat this one for a long time. Perhaps with short sleeves in a lighter color. 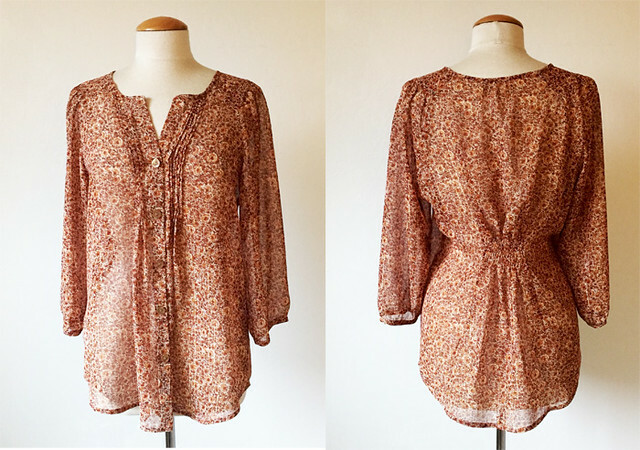 Although I'm really itching to try this McCalls 7538 which is a dress or top. And I have plenty of striped knits in my stockpile ready to use. That's all for now. I just started sewing another pattern repeat (a New Look pattern) and have plenty of other things in the queue. So stay cool everyone, summer is on it's way here and everything is so green. Which may last a bit longer this year due to our epic winter rain. The daffodils are almost done blooming but the other day when wandering around with my camera I came across this one - so pretty. 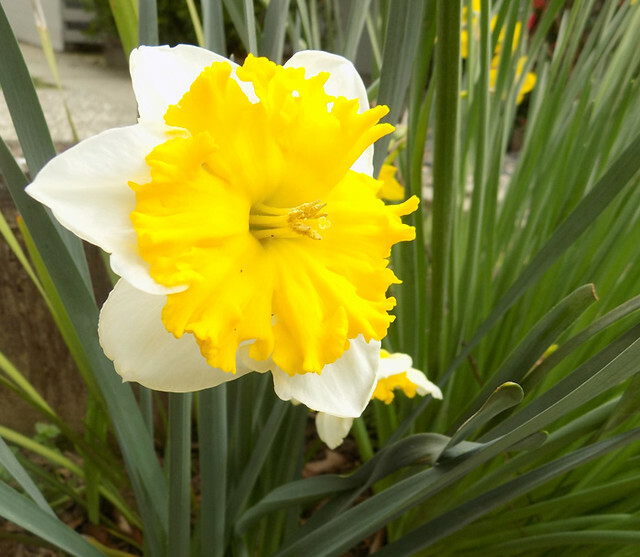 It pays to plant lots of daffodils, all kinds of varieties as they come back year after year. Plus I don't really keep track of where/what I planted so there are lots of nice surprises. What? This is the first Random Threads post for 2017? Time to expand on the scribbles in my notebook and discuss. Since it is timely - at least here in alternately sunny and rainy California its timely - when do you change over from winter clothes to summer? Or do you even do that? It's commonly said that here in the bay area we don't really have seasons, but I beg to differ. As long as you are not near the often foggy coast, the summer days can be absolutely lovely or even stinking hot. 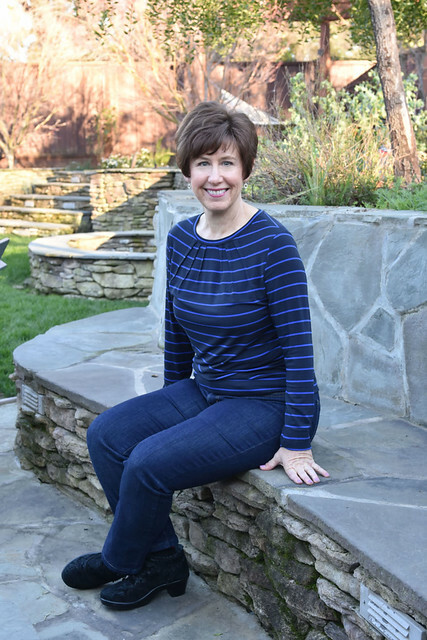 So I had a childhood of switching out the winter clothes, boxing them up and placing on the high shelves of the closet, with the accompanying exchange of shorts and swimwear that had been tucked away for the winter. I love that moment when it is warm enough to wear shorts and sandals, walk barefoot on the grass and enjoy the warm evenings outdoors. We're not quite there yet - as it has been off and on rain for the last week or so but we had a spell of warm weather and I am ready for more. So I did put away some wool sweaters and cleaned up the t-shirt drawer. Bring on Spring! Do you pack away your winter clothes or have a multi-season wardrobe? I can be kind of stubborn when it comes to sewing up a new shape or style, sticking to what I like. But at the same time I am always on the lookout for something new that will still make me feel good about wearing it. Here's a dress I sewed last year that was a bit of an experiment, summer ended so I didn't wear it but I will try it this year. Recently I did some sewing for someone else and she brought me a pattern that I would never have chosen myself. I sewed this version for her, and while it is not a color I would choose the shape and style of the pattern I really like. I sewed View D shown in red on the pattern envelope. This is the only pattern I have ever seen that specifies using elastic thread to create that small gathered section in the center back - a nice detail. 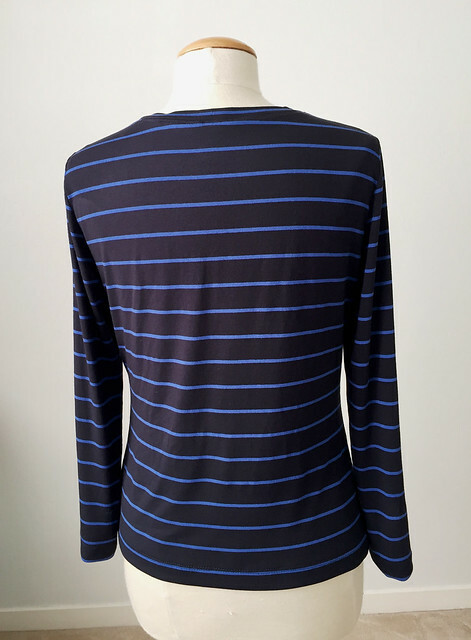 Anyway, I reserve the right to slip on things I am making for others (for educational purposes :) and I thought the shape of this top is lovely. 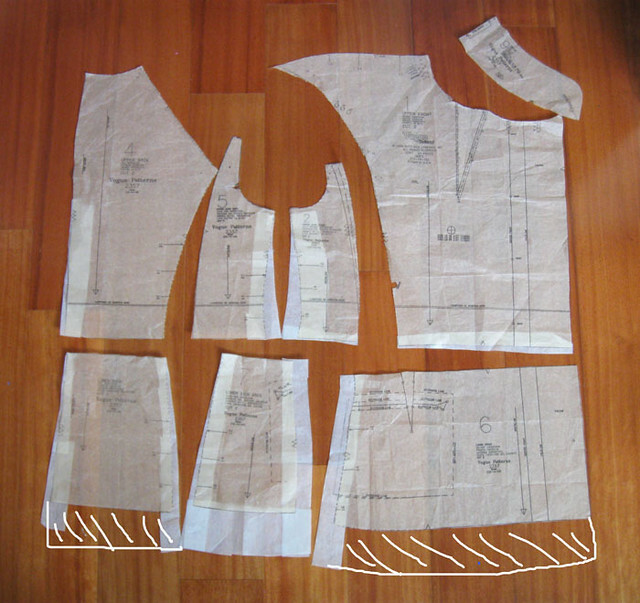 So I traced off the pattern pieces and will try to make one for myself later this spring. If I find a nice silk it would be really pretty. 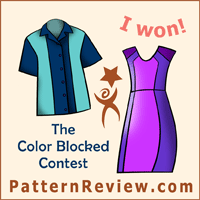 I can tell you that this one was kind of a test - and then I made another version for her in silk chiffon. eeeeeekkkkk!. All those little tucks down the front. whew. I don't know the pattern rating but I would not call it easy. I must really like it to do those tucks again! Anyway the whole exercise proved to me that I need to try on stuff that I think I won't like, just to see. Although I did that with a cold shoulder top in a department store and almost fell down laughing as I thought it looked ridiculous - on me. Some versions look great on others. That's just the reason to try various things out. I just saw a new trench coat pattern (Deer & Doe I think) and it has no lining, just taped seams. 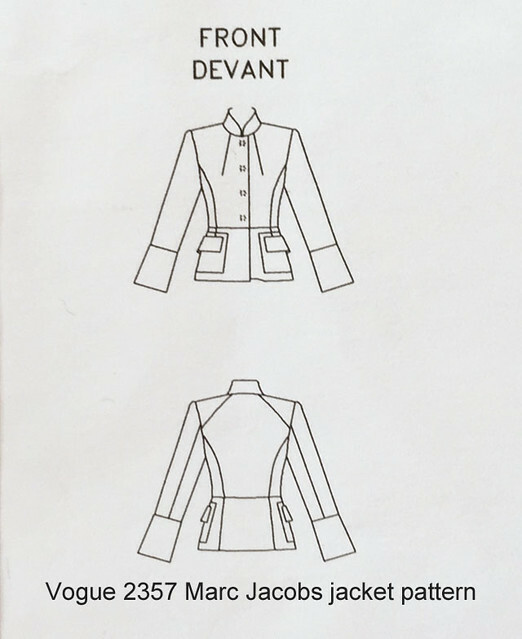 There are a lot of jacket and coat patterns with no lining, or not even an option of lining. This is something I just don't get. I put linings in everything and the thought of doing every seam with bias tape would make me scream. 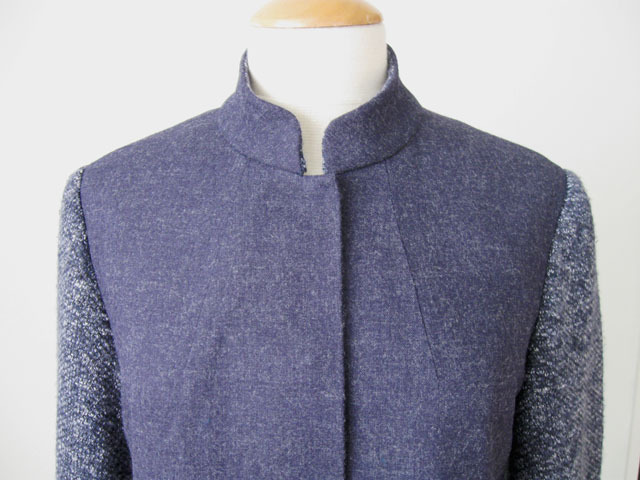 Yes - sometimes it looks nice and works, mostly on casual jackets but I wouldn't wear a coat or layering piece that didn't have a lining. Mostly I like linings because then your jacket or coat wears better, less wrinkling, slips easily on over your shirt or dress. I have a Lisette jacket pattern that is really cute but I suspect it has no lining - so I'll have to give that some more thought. 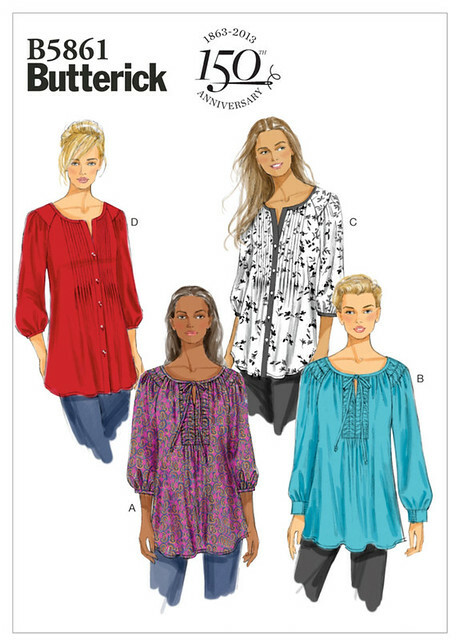 Even though I rarely buy them I like to look at the European indie sewing patterns. 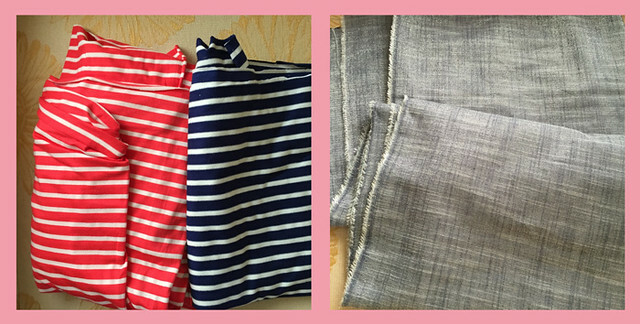 My pal Sewing Tidbits just did a round-up of French sewing pattern companies with lot of links. And she is starting to create her own patterns, exciting! Pauline Alice patterns are my favorite so far, perhaps because she does unique things (not another basic top but instead very distinctive styles) I sewed her Quart coat, Saler blazer, and Alameda dress and loved them all. Named Clothing from Finland have a lot of interesting styles - but nothing that has grabbed me. 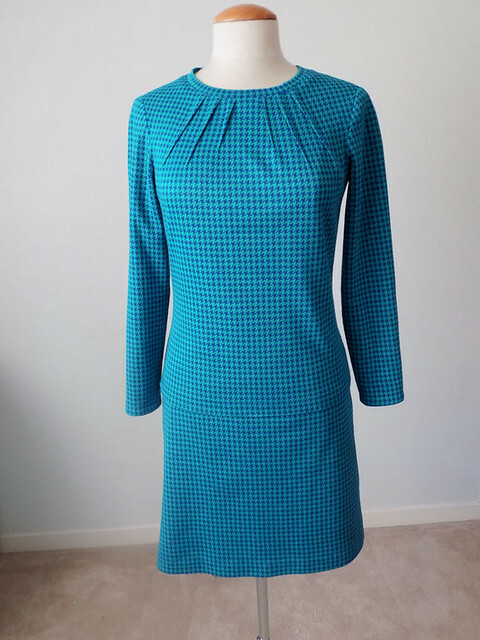 For the most part if I see an interesting detail, either in ready-to-wear or in a pattern, and if I don't already have the pattern or one that could be adapted, then I look at the BurdaStyle website and usually find something similar. For some reason putting together a $ 6 PDF pattern is way less annoying than putting together a $ 20 PDF. But they are all still annoying. Anyway I am always on the lookout for some interesting and more advanced patterns so let me know if you discover anything. 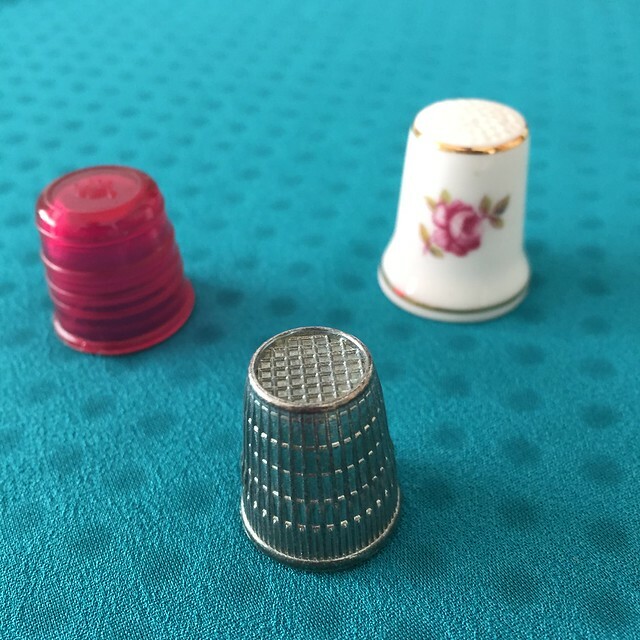 Were you sad to hear that the Monopoly game is discontinuing the thimble as a playing piece? I was. That was always my choice when playing Monopoly. Do you use a thimble? I certainly do for certain tasks. Sometimes it is the only way to prevent puncturing your finger when hand sewing through very thick fabric. The metal one above is great for that. The pink one is a sort of soft plastic, with a slight grippy texture and it makes sewing quicker, at least for me. The ceramic one someone gave me, I suppose you could use it but I keep it around because it's pretty. Using a thimble does take a bit of practice but once you get the hang of it then it really helps. I see a lot of great garments made with lace fabric and it has been really popular on the runways for the last few years. But it's just one of those fabrics that I have no interest in sewing with, or making a garment for myself to wear. Along with scuba. Scuba fabric to me feels like wearing 7 layers of polyester fused together - not an appealing idea. But maybe I'm wrong about that. In any case, if you touch a fabric in the store and it gives makes you shudder but not in a good way then I imagine sewing with and/or wearing would be no different. Is there a fabric that is just not for you? 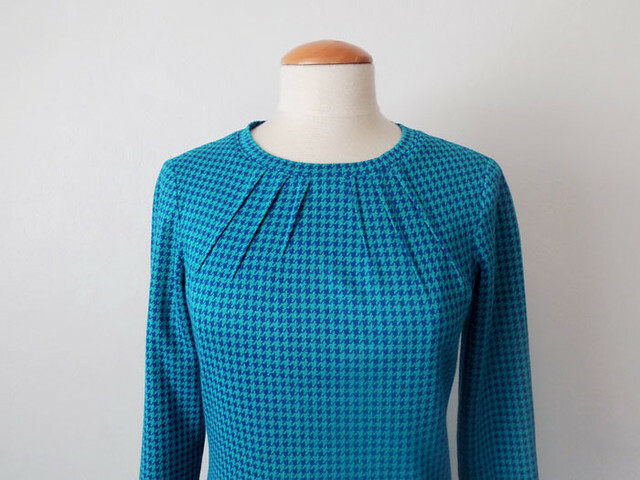 Did you take a look at the Colette Patterns reissue of their free Sorbetto top pattern? They have been revising their design work, I believe revamping their blocks and sizing. So they revised their Sorbetto tank top pattern. And it looks.....not good. I can't stand the way they do bust darts, always too long so they are too visible from the front. They seem to choose fabrics that don't match up well for what they are showing, and they never fail to have the examples fit poorly on the models. For the same $18 the patterns from Named (mentioned above) seem a lot more sophisticated. Nothing much since my trip to NY last October, and I am making progress on a few of those fabrics. But I did pick up a couple of things recently. That's all for today. 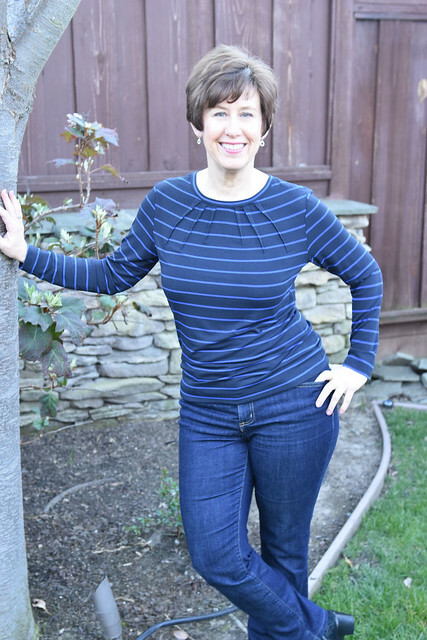 Up next, another version of Vogue 9205. my current fav t-shirt pattern. (so fickle, always a new fav which is usually the last thing I sewed). And some work in the garden, replacing some fences, removing the ivy which I can't stand, and hopefully creating more sunny spots, for more plants! But in the meanwhile its a disaster zone. Happy sewing and Happy Spring! 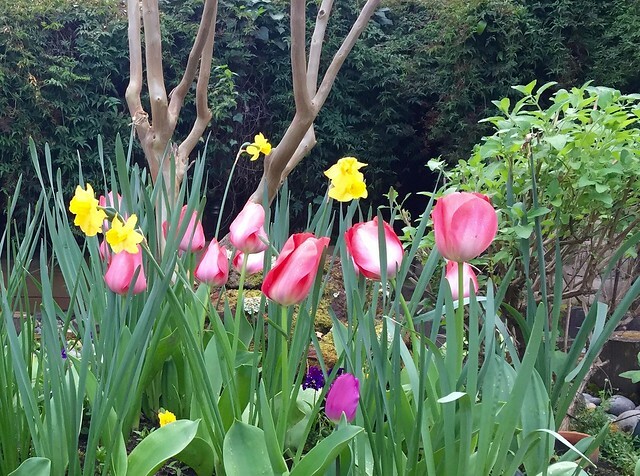 today's garden photo, more tulips. It's just not possible for me to wear any color other than green on March 17. Of course it's St. Patricks's day and I do have plenty of things to choose from. One of my favorites is this skirt made for my green item in 2013. Or I could wear my green coat which was my most worn item this winter. But that's not very likely as it was in the mid 70˚'s today, so no coat required. A rummage around in my closet for a green t-shirt will be likely tomorrow as it's just about sandals and shorts weather. With my apologies to those of you still in the grip of winter. The Irish family heritage goes deep - both my paternal grandparents were born on the west coast of Ireland and them emigrated to San Francisco. I've been fortunate to go to Ireland twice and would go again anytime - it is so beautiful, so much fun, and the food is fantastic (yes, really). So this year's green outfit was finished a while ago, already worn and now relegated to the back of the closet until next fall when it will be more suitable. But it does highlight a pattern that turned out so well, I have already used it twice with very likely more to follow. 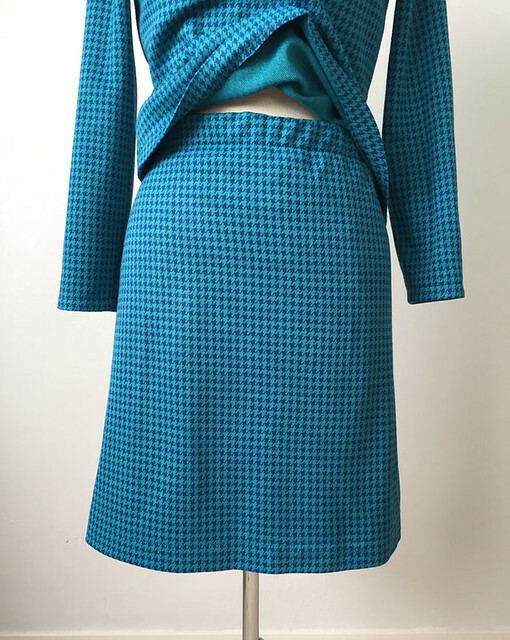 Also this fabric is a green/blue houndstooth and the green looks a lot greener in person - all these pictures make it seem more like an aqua/blue combo. The pattern is Vogue 9205 which I included in my pattern whisperer post a few weeks ago. 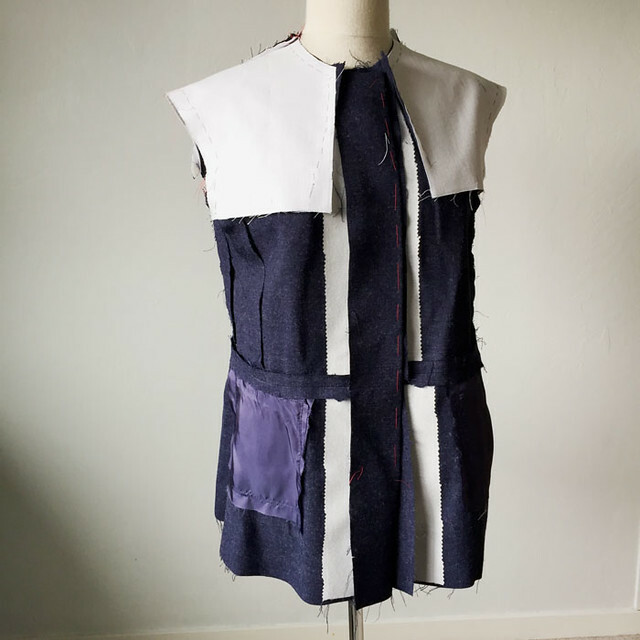 While this pattern doesn't have a lot of variations other than the sleeve length it sewed together really well, the darts add some fitting and shaping across the front even though they are decorative darts not fitting darts. 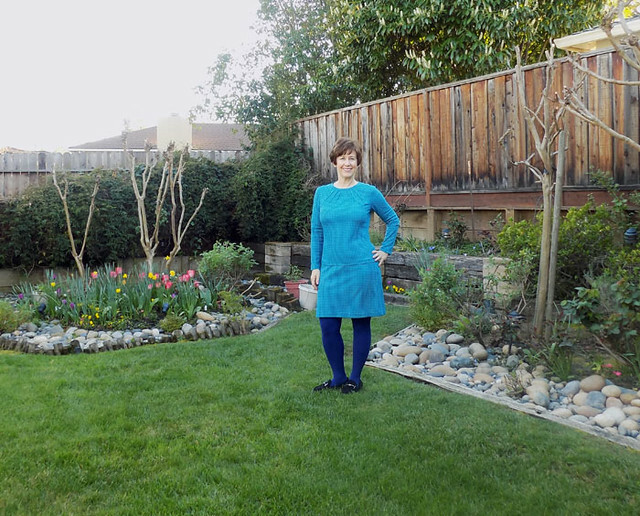 The pattern calls for a regular jersey type knit, and my fabric was not that at all! I bought this fabric at a American Sewing Guild stash sale a few months ago, it was two yards/60" wide. And kind of weird. Basically I think it was a bit on the vintage side, with very little stretch even though it looked like a knit. So there is almost no give in it, and it's a good thing the top fits. But I can't say it is the most comfortable thing I have made. Here's proof, my super awkward looking backyard timer photo. I just got a new camera and am trying to figure out the settings, work with the light etc. Starting with a houndstooth fabric is probably the worst idea - do you have this issue where checks like this look all wrong on the camera or computer screen? Anyway - you can see I had enough fabric to make a skirt. Which I did because it was there. And what else would it become other than just a remnant? And when I first got this fabric I thought about making a dress but then the idea of the top seemed more wearable. 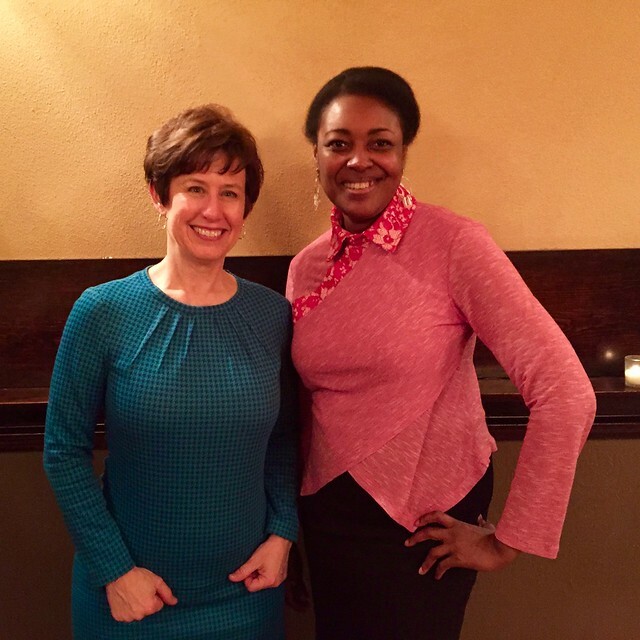 And a much better photo of me and Pauline at the Bay Area Sewist's Frocktails event last month. She is one of my many sewing muses - every time she posts something I want to sew it. I even bought similar fabric and the exact pattern to copy the version she did of a Vogue pattern. Maybe I will get to it this summer. In fact she and I buy a lot of the same Vogue and Burda patterns, and it is interesting to see how they look on different people (oh I wish I had some of her height :) Note she is wearing Vogue 9227 which I sewed a while ago and plan to give to a friend of mine. So that's the latest on my streak of success with Vogue patterns and news flash - more to follow! I hope you have a great St. Patrick's day if that's something you celebrate, and perhaps think about all the generations and waves of immigrants that contributed to our country, and welcome those yet to come. Here's a closer look at the tulips - every year I plant more bulbs in November and then instantly forget what color they were on the package. Which makes it a lovely colorful surprise! 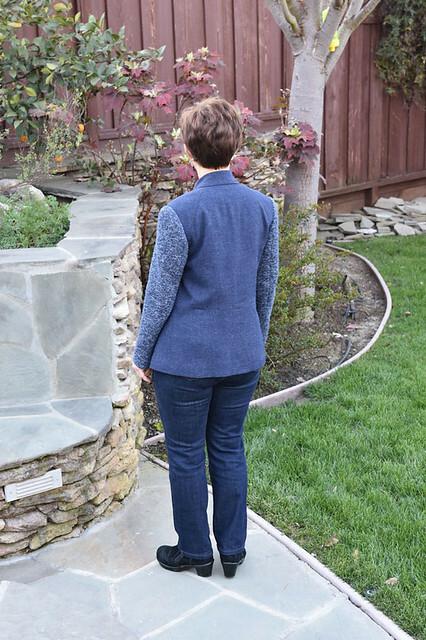 Before I move on to writing about my newer sewing projects I wanted to do a post with some details on the Vogue 2357 blue wool jacket with the contrast sleeves. I made it using a less than current pattern which was published in 1999, not exactly vintage but I posed the question of what to call these patterns that are not really vintage but not new. 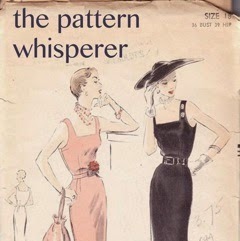 In my mind I think of vintage clothing and patterns as those items from the 50's and older. Maybe some 60's stuff also. But more recent, like 70's - 80's - 90's - those just seem old. Although I read that the Gap is bring back some of their 90's styles for an "archive collection". Really? 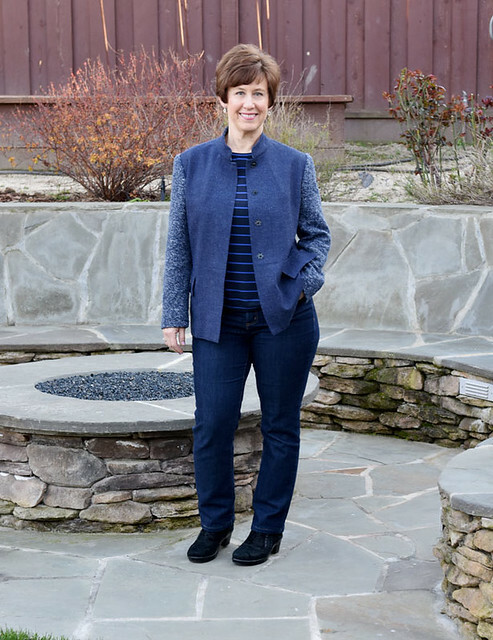 For one thing I don't think the Gap has been a style maker in a long time (ever) and for another I would be happy to never see that faded pale blue denim again. Please, let's not have a 90's style revival - it wasn't stellar the first time around. However a few commenters gave some suggestions for this pattern category of not new but not vintage, such as OBG (oldie but goodie) and late-model (as in recent but not new cars) I like them both so I will now have a couple of names for these types of patterns. Good thing too as I have a few that might make an appearance this summer in my sewing. Back to the sewing details for this jacket which appeared in my previous post. I happened to be in the mood to take pictures as I sewed for this one, mostly because it was such an interesting pattern and I thought some of you might like to see it. Here's the jacket on the dress form. 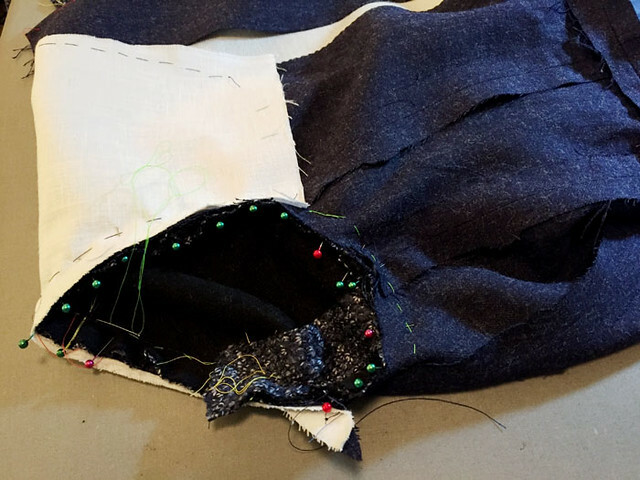 The pattern envelope and tech drawing are pictured in that previous post so you can see the seaming and dart detail. Of course every new pattern starts with fitting. I looked over the pattern, did some flat pattern measure as well as scrutinized the finished garment measurements printed on the pattern (thank you Vogue patterns - my editorial comment: this is a detail that sets the Big 4/5 printed patterns on a higher level than a lot of other patterns). I made a muslin of just the jacket minus the sleeves, to see the fit and also where the seams landed on me. Vogue size 12 is almost always a good fit for me in jackets and this one was as well. Note that this style has NO shoulder seam and the front wraps around to the back so options for fitting are somewhat limited by that design detail. Here are the pattern pieces laid out on the floor. You can see where I add paper to the various seams, some places tweaking the fit just a 1/4' or so, and other places (like the hip circumference) I generally have to add about 2-3 inches in total on a size 12. 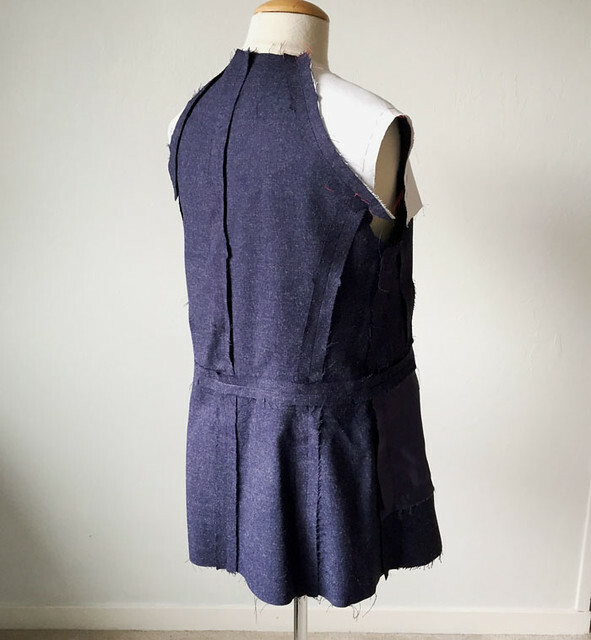 This pattern also has the side seams shifted below the waist, so that was kind of tricky - the pocket crosses over the side seam, wrapping around the body. Although on my final version it did not. I added about 2 extra inches to the hemline - this pattern has a faced hem (which I changed) so I added the 2 inches for hem allowance. I just put little tabs to remind me to add the extra length and then mark with chalk on my actual fabric. If you ever have a really full skirt and you want to lengthen it the same method saves you lots of taping of extra paper onto the pattern. You just have to remember to mark the extra length your fabric from the very first piece! That's why I add the paper tabs - as a visual reminder to do so. Since I had done the muslin the jacket sewed together pretty quickly. 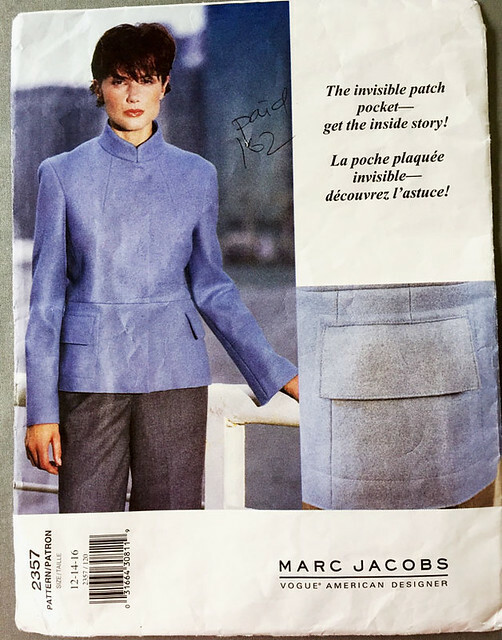 The pocket was titled "the invisible patch pocket!" 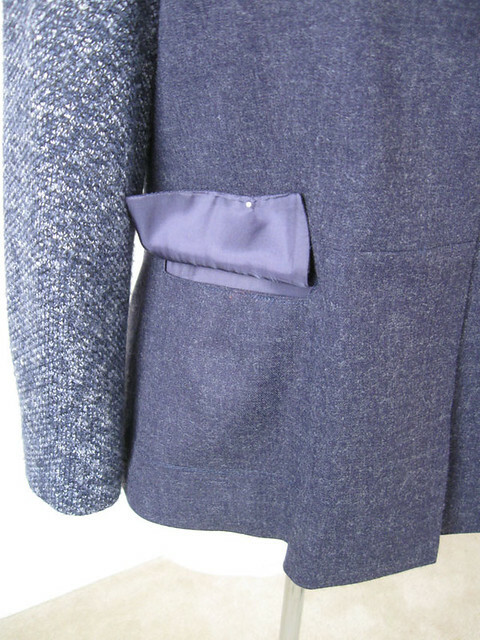 but it was basically a patch pocket sewn on the inside of the jacket with a flap to cover the faced opening. The pocket bag is stitched to the jacket front although on this fabric you can't see the stitching. (also my camera made it look grey not blue in some of these photos). Here's the more interesting detail. 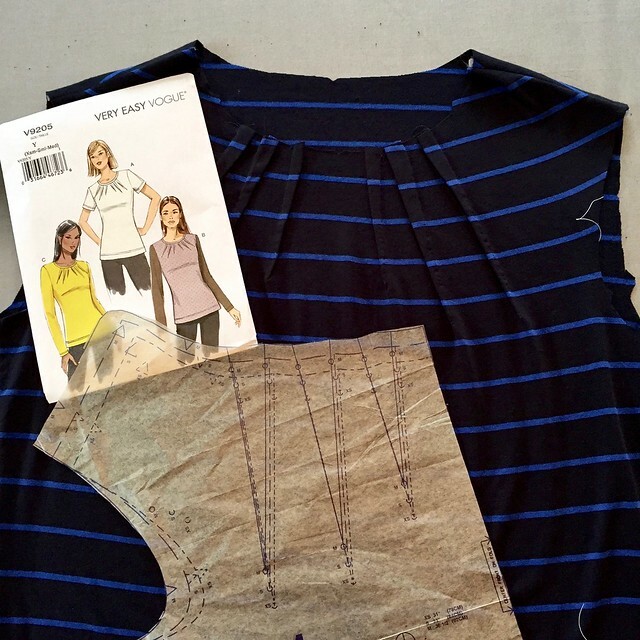 Since there is no shoulder seam the front curves over the shoulder and then attaches to the back via a diagonal seam. The had a pattern piece for making the shoulder stabilization piece, which you can see here in white. It is not meant to be fusible, actually maybe a lightweight hair canvas or something similar would be just right. I used a woven canvas that I had which seemed to match with weight and shape of the wool, and then I added a layer of fusible Pro-weft just to give it a bit more body. The pattern instructions had you hand stitch this into the jacket along just a few areas, you can see the running stitches. I really liked this level of detail and the result where this support piece is kind of floating inside the jacket. Note that the pattern called for a boiled wool or similar type of fabric so I was adapting a bit due to my fabric choice of this tweedy wool. A couple more fit adjustments once the jacket was stitched together. I decided the sleeves were too wide at the wrist, so tapered them in, quite a bit as seen here. About 2 inches in total. Proportion is so important to me and if something just doesn't look right I have to baste in an adjustment and see how it looks. Sometimes doing that proves that it was fine from the beginning but sometimes the smallest adjustment will make all the difference. 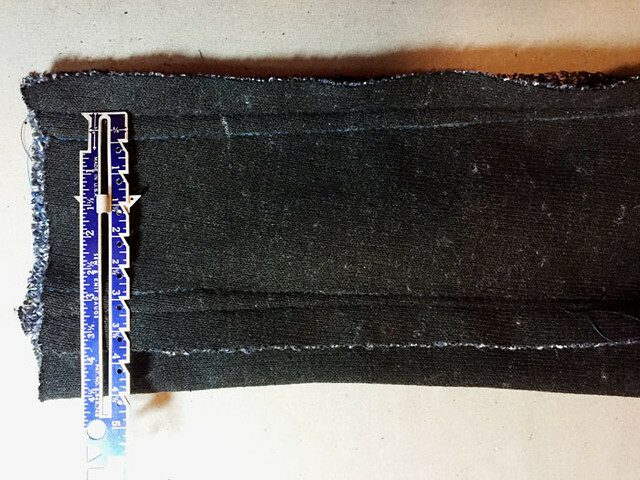 Here are the two seams on either side of the center back jacket, below the waist seam. 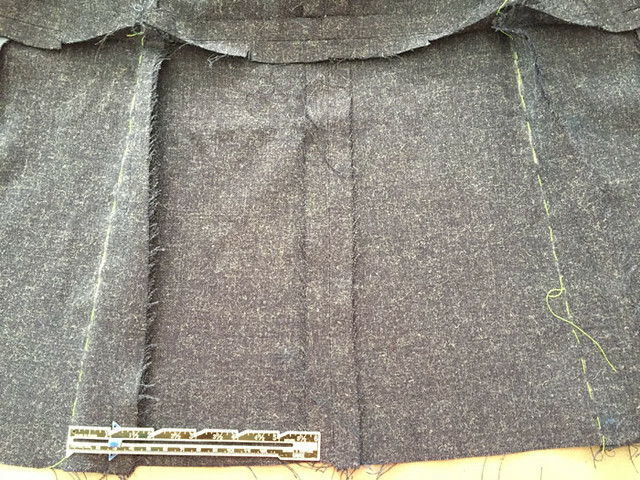 I took out about 1 inch at the hemline tapering to zero at the waist seam. Yep, it's a lot of put on, pin, take off, baste, check again, mark with chalk and then stitch. And then press! But usually on a garment I just have one or two areas to fine tune once it is sewn together so that's not too bad. 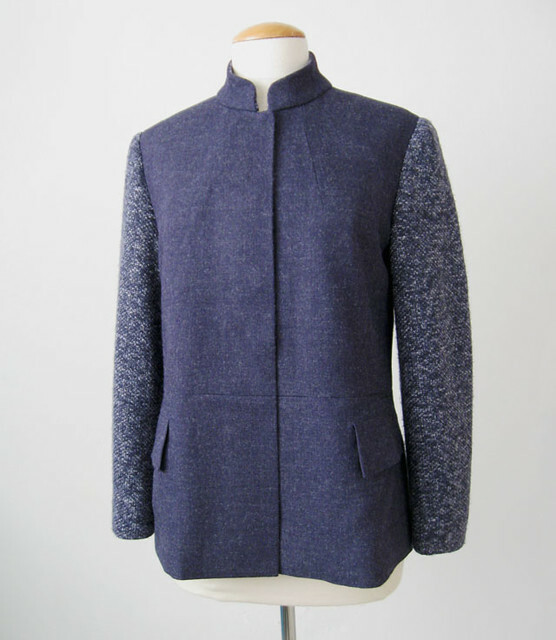 And the result means a jacket that I like versus one that I am not comfortable with. Since I completed this I have been wearing it a lot - you know how it goes when you finish something that can be worn with a lot of different things (meaning jeans). Although today it was shorts weather - seriously - spring has sprung - which means we will probably get some big storm around Easter but until then we are all pulling weeds and thinking about putting in the tomato plants! Happy Daylight Savings time sewing. I hope all is well in the northeast with the storm and that your spring arrives soon too. 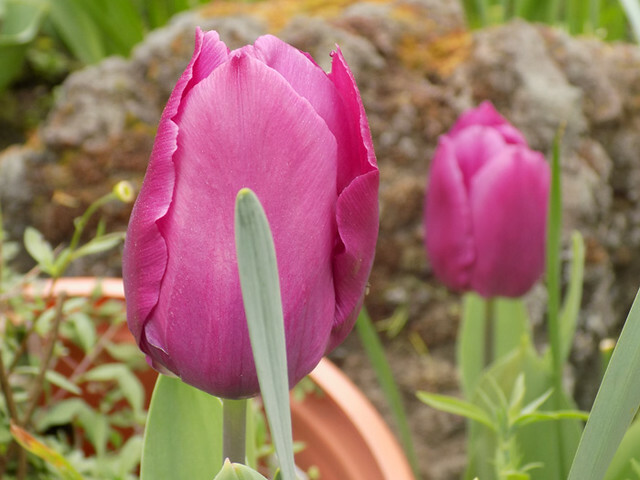 I always plant tulip bulbs in a rush and buy too many, so after putting them in the flower bed I have some remaining that I end up sticking in whatever bare patch of ground I can find. Including in the retaining wall. 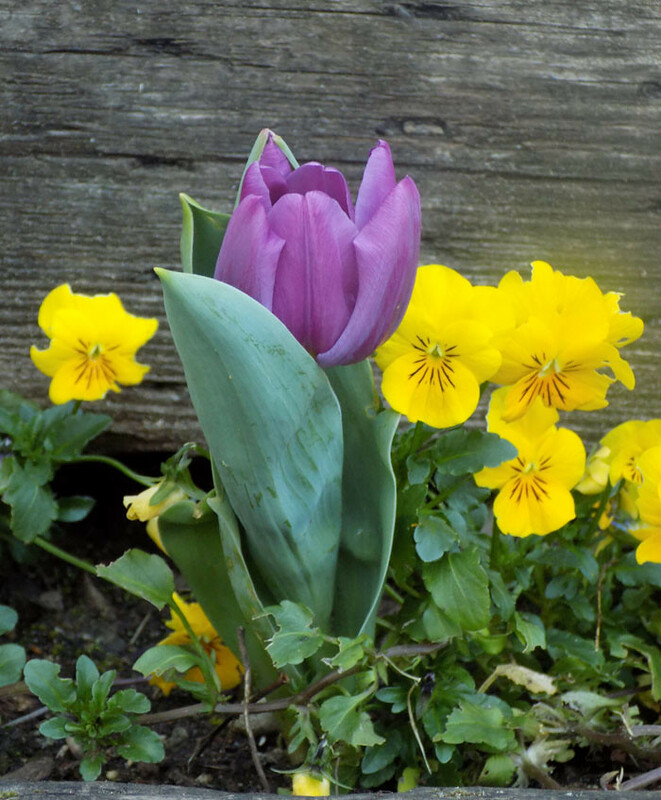 Thus this cute little purple tulip among the pansies. When does a pattern become vintage? As that same question for fashion. Is something retro? Revived? Reinterpreted? Reimagined? Is there anything new in fashion? I often say there are no new patterns, by that I mean that clothing styles and shapes come and go with the designs and details traceable through the ages. We can see fashions that reappear in our own lifetime or across the centuries. What brought on this philosophical musing? Recently I unearthed some older Vogue designer patterns which I had stored in a box in a spare bedroom, tucked away on the shelf where things like that stay because I can't let them go. Looking through most of these not quite vintage patterns I could see a lot of details and silhouettes I just saw in the most recent designer collections shown in NY. Also I bought a couple of patterns on eBay this year, which are not new but less than 10 years old. 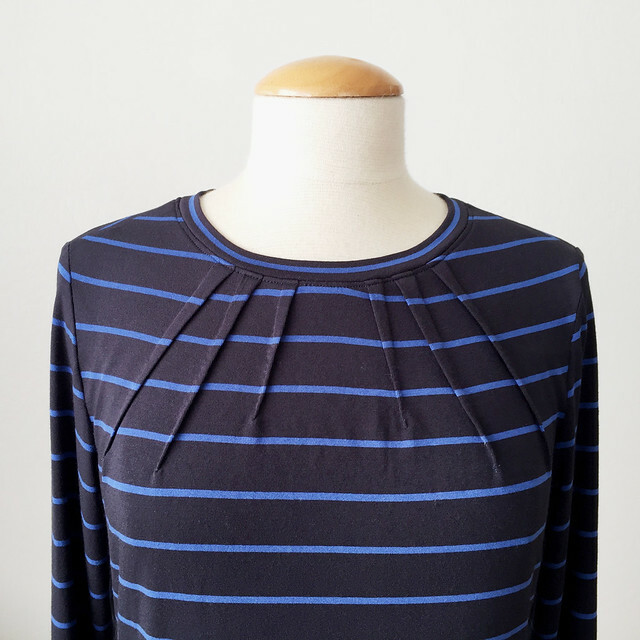 I'm always on the lookout for interesting details these days, a shirt with an unusual collar or neckline, or a dress with some clever pockets. Basic patterns have their place but I hope that pattern companies continue to provide the more complex and interesting ones as well. Which brings me to my latest sewing project. I got a pattern sometime last year, probably at an ASG sale or maybe at a swap. I can't really remember, but it's a pattern that I took out and looked over at least once a month, thinking about making it. Also I had some fabric that was not at all what the pattern called for, but I really liked it, so I gave it a try and now I love the result. It is a bit of an odd one so I will give you the dress form view first, but I do have plenty of pictures of me wearing it. Check out that interesting darting, and the seaming is unusual as well, although it is really hard to see it. The main jacket fabric is wool (I definitely recall buying this for $3 at a sewing group sale, score!) It behaves like wool and presses really well, crisply, almost like denim which is kind of odd for wool. Perhaps that gave me the idea to make it into something that is more casual. AND I only had 2 yards and it was 45" wide so no possibility of getting the sleeves on the solid blue. I had that idea in the back of my mind to change it up and do contrast sleeves (due to my success with this favorite jacket). So I carried a little swatch of this solid blue wool around with me for ages, knowing that whatever jacket I used it for it would need another piece of some fabric. What I found was the proverbial needle in the haystack as this sweater knit is pretty much the best possible color match. And was at Joann's, and is thick and soft and exactly what I had in mind. The selection there is uniformly terrible and then every once in a while I find a gem. Now we get to the not quite vintage part of the pattern. It's a Vogue Marc Jacobs pattern, copyright 1999. So almost 20 years old. By the way - I have plenty of sewing and fitting details which I was going to post first - but since I have been wearing this jacket already I decided to show the jacket first and then in the next week I will do a post on fitting and sewing. Maybe I liked it because the model has short hair 😊. No, not because of the short hair. Look at these details - I just thought the darts and seaming were really interesting. There is no seam at the top of the shoulder, the front wraps around to create the diamond shaped seaming in the back. I do think this jacket looks best when closed. But then when closed it also has a slight Star Trek vibe - not a look I typically go for. Also it calls for the large snaps as closures, as opposed to buttons or a zipper, which is interesting. I don't think I've ever made something with the large snaps. Certainly fast to sew. I think it is a bit broad in the shoulders - and I already narrowed it a bit when sewing. But I might do another adjustment. Details in the upcoming post. This is one of those fabrics that looks a different color in every photo and in every light. The outdoor pictures are more accurate. I put the sweater knit on the inside of the collar so there would be no possibility of itchiness on the neckline -my achilles heel in winter wear. 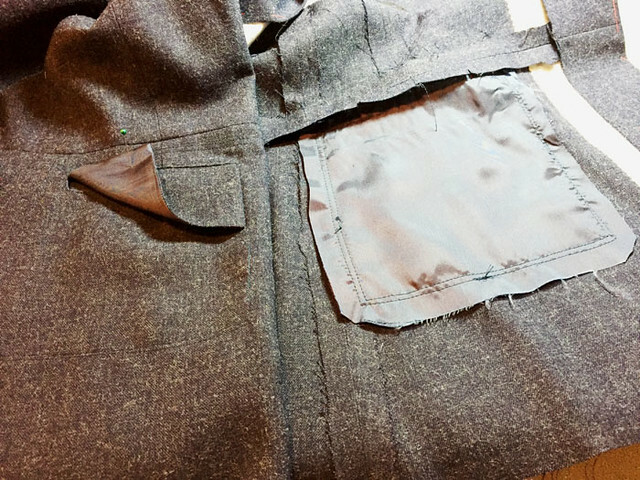 The pattern envelope specifically mentions these "invisible patch pockets." I didn't think they were anything super unique - but the instructions were good and they came out perfectly. 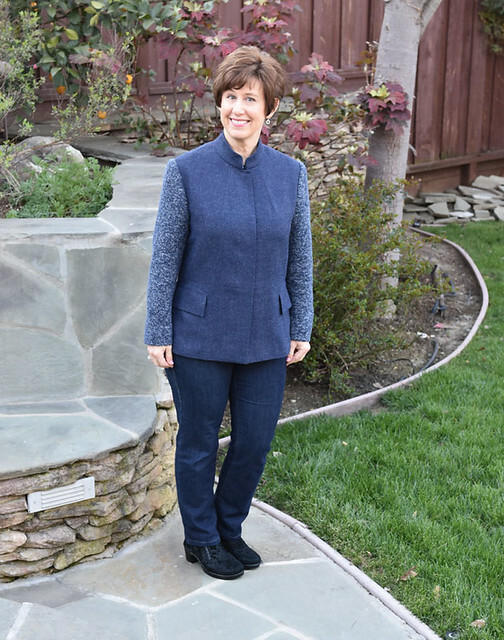 And add to the sleek shaping of the jacket body, the pockets kind of wrap around the side seam. 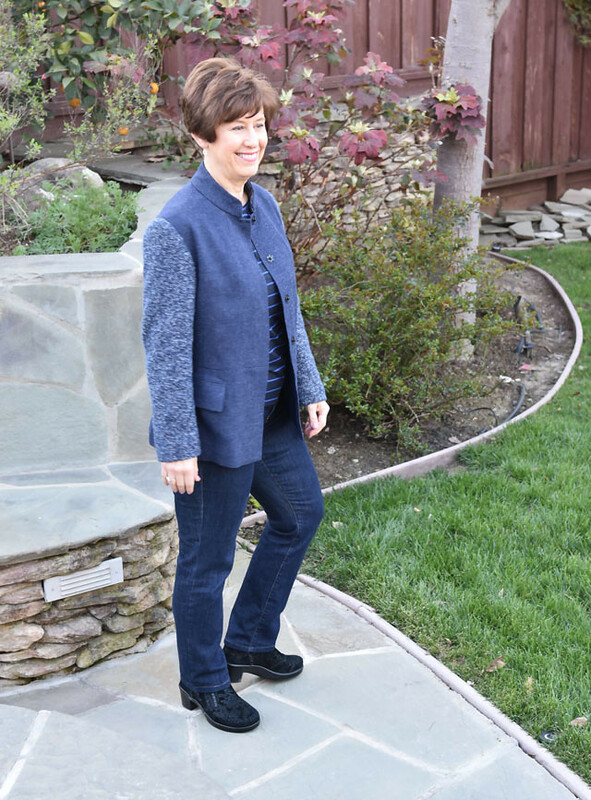 This is one of those blue jackets that I think - does it go with jeans? what color denim? darker denim or close in color? Oh well, I will probably throw it on with any old jeans as the knit sleeves make it super comfortable and the whole thing is lightweight yet warm. In a post a few years ago I posed the question of what to call these patterns that are not new, but not really old. I think I called them recent-retro which seems as good a name as any. I think we need a name for this category. Think about it and let me know if you have an idea. I keep thinking spring is about to be declared around here, the trees are blossoming and the bees are all over my citrus trees. But today we had hail, LOTS! and snow on some nearby mountains. What? Check back with me in a couple of weeks - all will be different and I might be planting my tomatoes. Up next, no idea. I'll see where the weather and my mood take me. 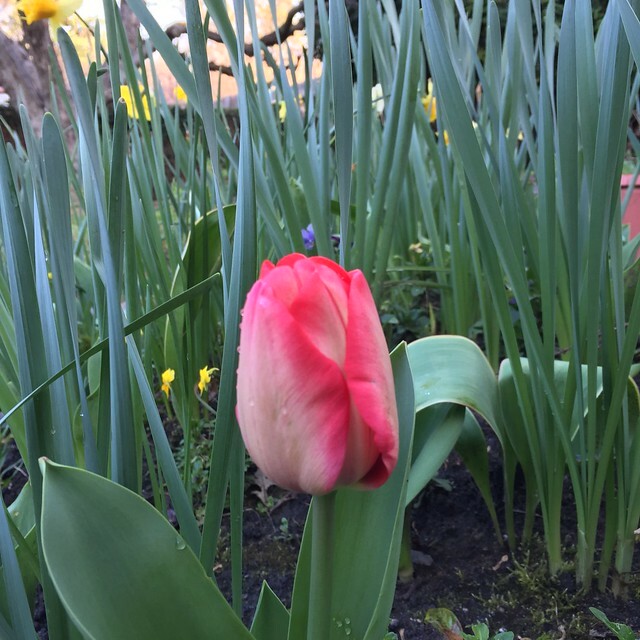 today's garden photo - the first tulip!